Join Marti for an annual tradition featuring today's leading jewelers inlcuding McKee Platero, Richard Chavez and Gail Bird & Yazzie Johnson. Also, see work from major historic jewelers including Kenneth Begay, Fred Peshlakai, Leekya Deyuse, Ausin Wilson, and Ambrose Roanhorse. 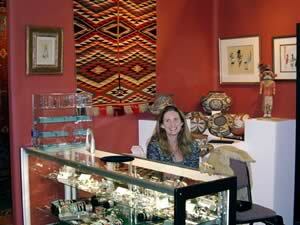 Guest appearances by four Hopi jewelers: Sonwai, Raymond Sequaptewa, Bennett Kagenveama, and Griselda Saufkie. A portion of the proceeds will be donated to Hopitutuqaiki, a Hopi school of the arts. Hopi students in this groundbreaking school will be taught by Hopi teachers in their native language.